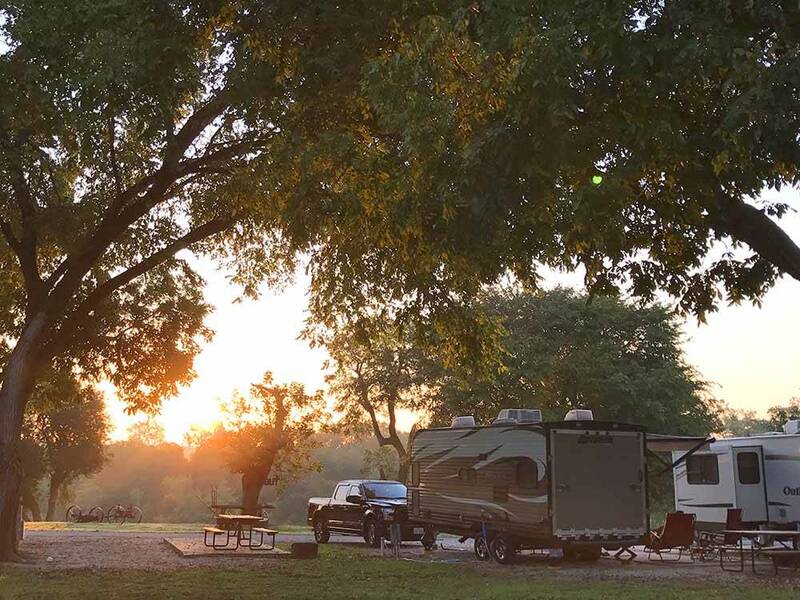 Relax in our scenic, peaceful location along the San Marcos River where you'll enjoy the shade of our huge pecan trees. Fish, float or just sit. Swim in our heated pool. Our mild winters make us a prime snowbird destination. We have stayed here numerous times in the last few years and have always looked forward to our visits. I called to make reservations and was rudely informed that they did not take reservations on the phone. I asked how I could make sure we were in a spot where we could get satellite reception I was told we cannot request specific sites and would have to take what they assigned. OK! Went to website to make reservations and made a note about satellite. In order to make the reservation we had to PRE-PAY FOR OUR TWO WEEKS STAY AND THERE WERE NO REFUNDS. NO EXCEPTION! Even if the park flooded (which it has a few times recently), only credit on next visit. Upon our arrival in a half empty park, we were placed next to pipeline workers who got up early in the morning to go to work. They were very nice guys and not rowdy, but we are retired and have done our time getting up early. Again I will say that the park was half empty, the grounds and customer service have continued to go deteriorate with each visit. Hi Stevic, thank you for your review. Our weather refund policy has been in place since 2015. You stayed with us in April 2018 and we didn't receive any negative feedback from you then. Our online reservation system is in place to avoid miscommunication, and put the power in the hands of our guests. Online, you can verify all your reservation details before booking, which helps us avoid any mistakes. You requested a pull-through satellite service site in the 500 row. We put you in site 517. While we are condensing sites right now to make room for our Winter Texans, we still want all our guests to be satisfied with their sites. We know your neighbors well and they are always respectful to other guests. But you could've come to our office in person to talk about your concerns, and we would've done our best to accommodate you by seeing whether there was another site you could move to. We wish you the very best. Arrived on Sunday afternoon to a very run down park. The gates are gone. Driveways in very poor condition. The photographs on the website are not representative of what is there. No one was in office but we had a reservation so paperwork was waiting for us. Paperwork stated that we must check in with them by 10:00 when they opened the next day. We were touring San Antonio on Monday so I started calling them shortly before 10. Left several messages. Finally reached someone about an hour later. Told me that we must come into office in order to get discounts. The don't take Visa, just MasterCard. We left our visit to San Antonio early to make it back in time to get discounts as we were staying almost a week. Office hours are not conducive to tourists to the area and they don't care. Site was basically okay. Nothing fancy. Early Wednesday morning the rains started. We expected those. What we didn't expect was 8 inches of flood water surrounding our RV. What quickly became apparent was that their regulars are given sites in higher elevations and the few of us travelling through were put in the flood zone. NO ONE came to help or even asked if we needed help. Even worse, everyone knew the rains were coming and they didn't bother to tell us we would be flooded out. Unless they know you: don't stay here. I don't understand the high ratings given for this park. Jafud, thank you for your feedback. It sounds like there has been some miscommunication. Our office door is always open to our guests who have questions or issues. Our desire is to have these conversations in person, to alleviate frustration. Since we weren't able to talk to you while you were still at the park, some insight regarding what you mentioned. 1. Our gate system was destroyed by the Memorial Day and Halloween floods of 2015. Once our 5-year recovery plan is complete, the gate system will be operational again. Far from run-down, our park is actively maintained by a team. We are currently working on our pool, stairwell, painting the buildings, and tending the grounds to get ready for our summer guests. 2. All of the photos used on our website were taken after the flooding. Anyone is welcome to go on our social media accounts (Facebook and Instagram) to see new photos of the park, which are being shared constantly. 3. The road to get to Pecan Park is maintained by our municipality. We have petitioned them multiple times to take care of the road better, but it's been a source of frustration. But as of yesterday, almost all of the road was paved! We've shared your frustration, so we're extremely happy to see this action taken. 4. I've talked to all of my office staff, and it seems there was a miscommunication regarding check-in and discounts. We would never interrupt a guest's vacation plans if a check-in could be pushed back to a later time. We normally require discounts to be verified in person for obvious reasons (e.g. showing Good Sam card or military ID), but we would've taken an email attachment of your card because you were away from San Marcos. 5. We don't have any record of receiving 8 inches of rain during your stay. Even with that amount, there would be no danger to life or property, so we wouldn't do any kind of check-in site to site. We have a rigorous process for taking care of our guests in the case of actual flooding, which involves making phone calls to each guest, and then going to each RV and knocking on the door. If you were having any issues whatsoever, I wish you would have reached out to our office. It's our job to take care of our guests, but we can't fix what we don't know about. All the best to you. Check in office is up a flight of stairs to a second story office. Check in was smooth and office personnel were warm and friendly. A few items you might expect to fine in a "camp store" but not many. Park appears to have many full time "homesteaders" working in the area and living in the park. Large speed bumps on the streets in the park. The park stated they had metered LP however, there was a problem with the pump and the attendant couldn't repair it and didn't know when it would be fixed. Overall park was quiet and a nice setting near the river. Good for overnight but not a long stay place for us. BCPC, thank you for taking the time to leave a review! There is an elevator up to the office on the right side of the building, as an alternative to the stairs. We apologize that our propane fill station was down during your visit--it is back up and running now. Anyone can fill propane at our park you don't need to be a guest. Happy trails! Nice facilities. My only complaint is: They have a coffee pastry get together in the am on a day of the week. The pastry consisted of doughnut holes. My interpretation of pastry is Danish type of pastry. Not doughnut holes. The staff was friendly though. Thank you for taking the time to review our park! Glad you enjoyed our facilities and staff. We try to keep Monday morning socials new and interesting by switching up the free menu, sometimes homemade goodies, kolaches, bagels, etc. We hope you will join us again for a different menu item. Safe Travels!